This takes place at 9.30am on Sunday mornings. All ages are welcome and it is during this service that Sunday Groups take place for children. Tea and Coffee is served in the Church Hall after this service, where you will also find our Bookstall. 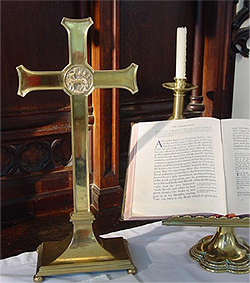 The 9.30am service usually follows the Common Worship format for Holy Communion although we do have occasional family services (without communion). Check the calendar which gives information on all services at St Paul's. Holy Communion at 8am every Sunday morning. Midweek Communion at 2pm on the third Wednesday of the month. This takes place in The Wilberforce Centre Chapel (accessed through the door at the lower level on the school side of the church). For specific dates, check the calendar. This is an informal service of worship, discussion and prayer which takes place on the second Sunday of the month in The Wilberforce Centre at 6pm. For dates and details, check the calendar. There are other services on special days throughout the year, such as at Christmas and Easter time, and for Ash Wednesday and Ascension. Our Confirmation Service usually takes place one evening in May or June. All services are shown on the calendar, and there will be full details for special services on the weekly notices on the news page. For wedding, baptism and funeral enquiries, please contact the Parish Office. The Church is open for visitors most Saturday mornings between 10.00am - 12.00pm. Check here for any closures. For any further information regarding the worship at St Paul's Church, please contact the Parish Office.